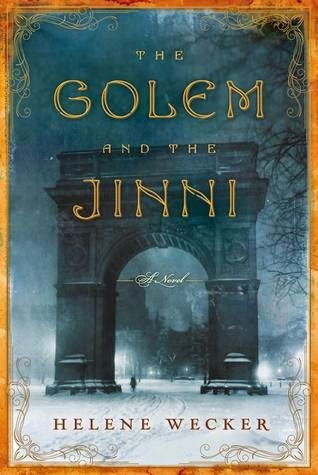 Wecker takes us back in time, filled with reality and fantasy, with her debut novel, The Golem and the Jinni. As the title suggests, the story introduces us to two mythical creatures in a world not their own. The first is Chava - a golem - a woman made out of clay that was brought to life by a rabbi. She was to have a master that she protected, but he died and left her alone to fend for herself only moments after being called to life. She drifts among the streets of America until someone recognizes her for who she really is and takes her in. The second is Ahmed - a jinni - a man made out of fire that was trapped in a copper flask. A tinsmith frees him from his prison, shocked by his tale, and yet willing to assist him in leading a new life. Both Chava and Ahmed struggle to find their place in the world, appreciating the kindness surrounding them, yet wanting to break free. One night, the two creatures unexpectedly meet, recognizing their differences in an instant - the differences that only a few can see. This one meeting turns into multiple meetings, and the two develop a very unlikely friendship. If only the two could know how that one night would change their lives forever . . . and help to explain the past. Wecker has developed a beautiful, yet enigmatic story. It is filled with details, sometimes beautiful and sometimes heavy, that bring an angle to the story that I have never read before. However, it was not just the story that won me over. It was more the narrator, George Guidall that hooked me into the story. His voice, his tendency to project such emotion and uniqueness into the characters was hypnotizing. If I were simply reading the story, I think I would have gotten bored and frequently set the book aside. Instead, I could not wait to get back to listening to Guidall read to me and take me back into the world that Wecker created. Have you read Wecker's debut novel? What were your thoughts on Chava and Ahmed? I did read this, and I wasn't thrilled with it. I had the physical book, not the audiobook, which it sounds like was a mistake? If I hadn't been reading it for the blog's podcast, I wouldn't have finished it, I don't think. It did drag in sections. Jenny @ Reading the End ... It did drag, but I think the narrator carried me through those sections. I tend to read all the books I pick up, but this is one that I think I would have ended up not enjoying if I was reading it in print. This one is on my TBR shelf so I'll be sure to pick it up at a time when I'm not going to be too distracted or looking for something exciting. Thanks for the heads up! Kristen M. ... You're welcome! Let me know when you do. I will be curious what you think.